On Wednesday, long serving defender and captain Musa Mohamed put pen to paper on a new contract that will see him stay at Kogalo until 2019. 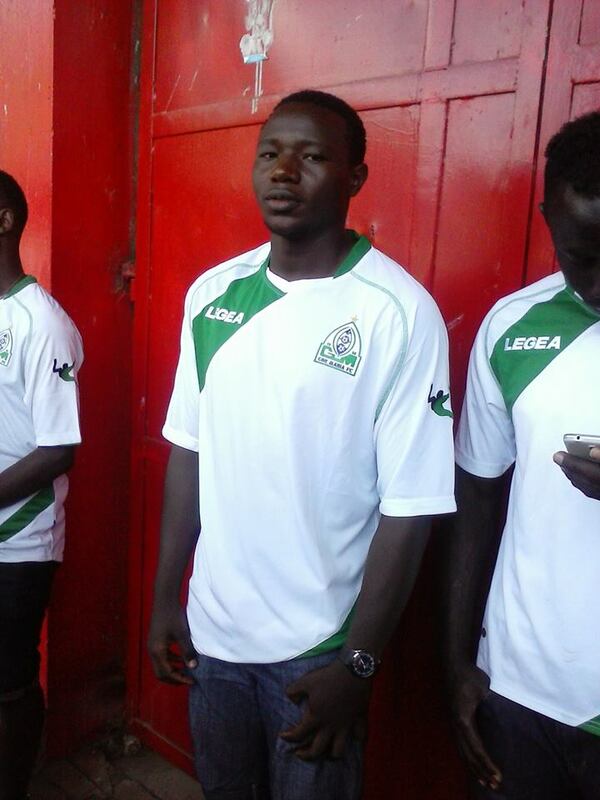 Mohamed is the longest serving player at the club having joined in 2010, soon after finishing form four at Langata high along with Kevin Omondi. The last two years have seen Musa build on his experience and play the best football of his life. Also penning a two year deal is Ugandan midfielder Godfrey Walusimbi. He has been instrumental as both a playmaker and occasional goal-scorer. His excellent form has seen him become a regular for the Ugandan national team. Coach Dylan Kerr is happy as he plots an assault on the 2018 Africa champions league where Kogalo’s record has been below par. “The expectation for us to go to the Champions League and win is high and the players want this platform to market themselves. It’s not good when you have players’ contracts running out because everybody will come for them,” said Kerr. “One of Sir Alex Ferguson’s biggest strengths was that he didn’t change his squad time and again. Look at his tally of premier league titles in England. If we want to be the best, we must copy the best.” said Kerr to the Nation. Resurgent George Odhiambo Blackberry has capped a succesful comeback when he was voted Kenyan Premier League (KPL) Player of the Month Award for August. 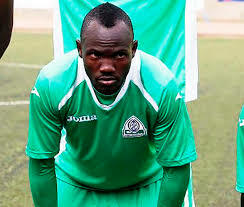 Blackberry was KPL player of the year back in 2010 and his career looked very promising. None other than the legendary Joe Kadenge was full of praise for Blackberry after seeing him play for the national team as a second half substitute against Uganda in 2010. He then went to Denmark to play for Randers FC but got very little playing time. The whole episode ruined his confidence. Subsequent stints in Finland, Armenia and Tanzania did little to restore his confidence. 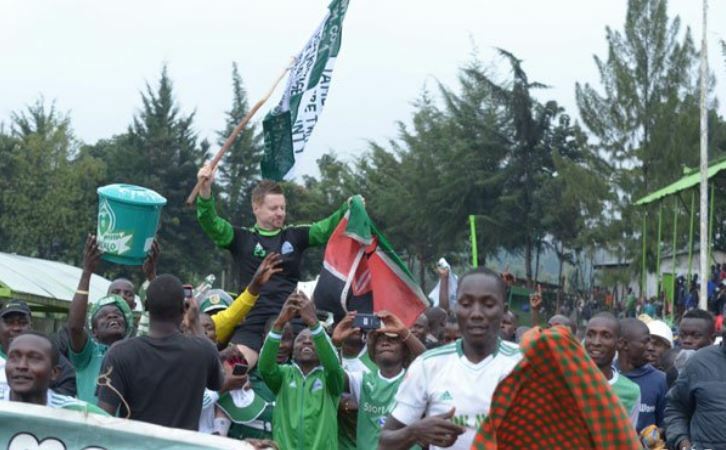 He would return to Kogalo in 2014 and it was under Frank Nuttall that his career begun its resurgence. His displays for K’Ogalo in August saw assured wins over Nakumatt, Muhoroni Youth twice, Posta Rangers and came from behind to earn a crucial point against fierce rivals AFC Leopards. Blackberry scored in two matches and provided three assists in the rest of the games hence putting himself in contention for the month’s gong. Gor Mahia created a clear path to the title in August with Blackberry combining with imports Tuyisenge and Meddie Kagere to take center stage. Having garnered 18 votes, he edged teammate Jacques Tuyisenge by a single vote in a winner-takes-it-all affair while the third contestant Umaru Kasumba of Sofapaka collected thirteen votes. The award comes with a 49 Inch LG television and KSh100,000 to feted players as well as KSh50,000 for the rest of the squad. Blackberry became Kogalo’s 2nd player to win it in 2017 following previous triumph by midfielder Ernest Wendo who in May. Blackberry’s contract is ending at the end of the season. He says he has received offers from other clubs but is letting his agent handle the issues. Having sealed the 2017 Kenya premier league title, Gor Mahia’s next task is to renew the contracts of six key players whose contract expiry is imminent. 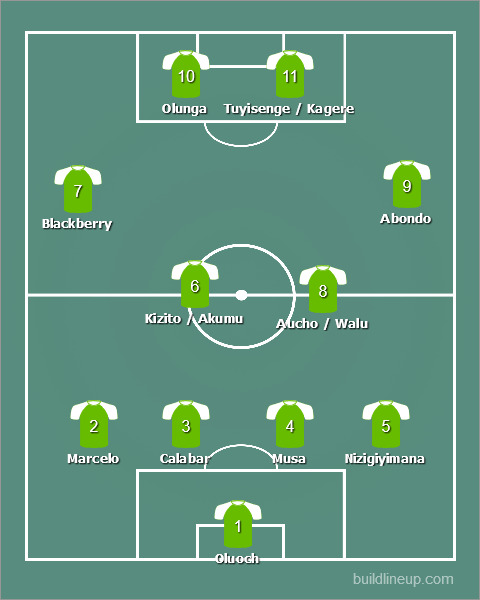 All six are important players whom Kogalo will need if they want to make an impact on the continental scene in 2018. Chairman Ambrose Rachier told the Nation newspaper that they would like to close out this issue by the end of the year. “We have learned our lessons and this time round we want to do things differently. We have already started negotiations with the players whose contracts are running out,” he said. “That is however a great challenge to us because it requires a huge amount of money in terms of sign-on fees and salaries for the players. And according to CEO Ludovick Aduda, Tuyisenge is being pursued by Rwanda APR while Walusimbi is being pursued by Orlando Pirates of South Africa. “This are our valuable players who we cannot afford to lose and are working round the clock to have them agree new contracts,” Aduda said. “We already have had preliminary talks with Tuyisenge and he is showing positive signs of staying with the club and should engage Walusimbi who returns to the country at the weekend and we believes we will convince the two to stay,” he said to the Nation. Gor Mahia are 2017 Kenya Premier League champions ! Gor Mahia clinched the 2017 Kenya premier league after they beat military side Ulinzi stars 1-0. The goal came via Meddie Kagere in the 14th minute. Gor Mahia have now won the Kenyan top tier league 16 times which is four times more than second placed AFC who have 12 titles and third placed Tusker who have 11 titles. In a dominant display, Gor Mahia have won the league with five matches to spare while also leading the league in goals scored (47) and goals conceded (18). Gor Mahia are the new Sportpesa Kenyan Premier League champions. They achieved the feat for their 16th title victory after they whipped Ulinzi Stars 1-0 at Kericho Green Stadium in a tough encounter on Saturday. Rwandese international Meddie Kagere scored the lone goal in the 15th minute to lead by the solitary goal at the break. The victory was warm welcome to the British Coach Dyerr Kerr who succeeded Brazilian Joe Marcelo Ferreira who had served at the club for only 14 months after he took over from Scott Frank Nuttal. The result left Gor Mahia perched at the top of the log with unassailable 66 points from 30 matches with four matches before they conclude their fixtures. A jubilated Gor Coach Kerr attributed their victory to high discipline in the team. “We have achieved all these due to a high sense of discipline among my players and their determination towards the title in every subsequent match,” he told Standard Sports. The Gor tactician who said he is not only contented with this victory stated that he is now focused on leading the newly crown champions to a continental title next year and emulate their 1987 performance when they became the first club from East and Central Africa to lift the Mandela Cup (formerly Africa Cup Winners Cup). “With the kind of quality of my players under me, we are now focused to win a continental title next season,” he explained. Gor are scheduled to feature in the prestigious Africa Champions League next season. 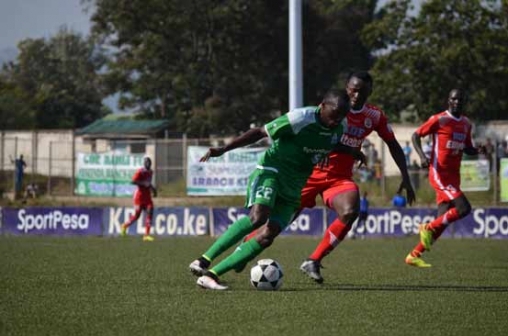 However, despite the victory, he decried the state of the Kericho pitch, which he stated affected their mode of play. “We would have won the match with a bigger margin had it not been the state of the pitch that was bumpy and affected our format of play,” he said. The loss left Ulinzi Stars Head Coach Benjamin Nyangweso boys tongue tied after the comeback of defenders Mohammed ‘Rio’ Hassan, Oliver Ruto and Geoffrey Kokoyo and midfielder Boniface Onyango and winger Samuel Onyango who missed their previous matches due in accumulation of yellow cards. Posted in: NewsTagged: 2017 Kenya Premier League, Gor Mahia vs Ulinzi stars30 Comments on Gor Mahia are 2017 Kenya Premier League champions ! 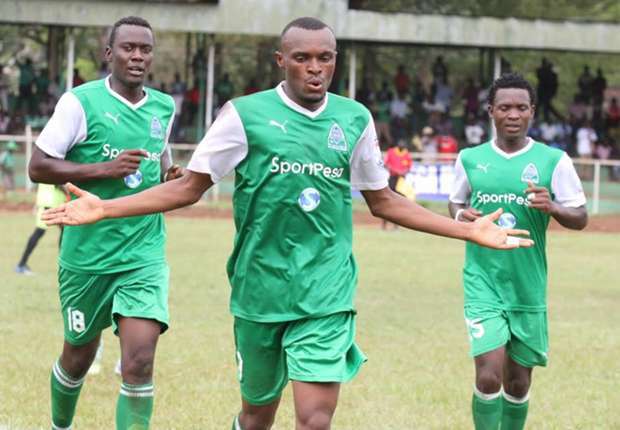 Gor Mahia’s Rwandese striker Jacque Tuyisenge, found the back of the net three times (in the 12th , 20th and 36th minutes) as Gor Mahia recovered from their weekend loss to Mathare to beat Kariobangi Sharks 3-1. 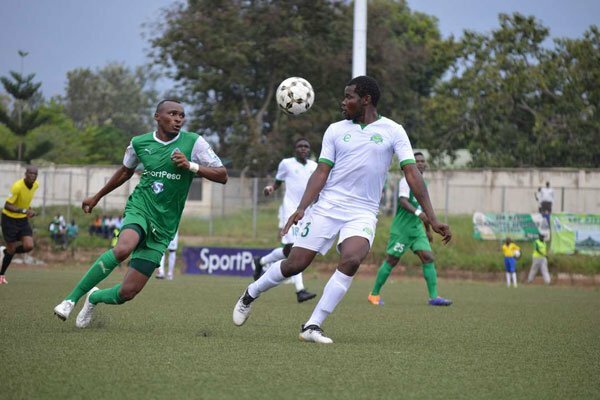 Stung by losing their fourth game of the campaign last weekend to Mathare United FC, Gor wasted little time in shifting through the gears in a devastating first half that saw Tuyisenge notch his treble in the 11th, 20th and 36th minutes. Masoud Juma scored the consolation for Sharks from the spot in the second half but the damage had already been done as the two sides reproduced the exact result from the first leg. 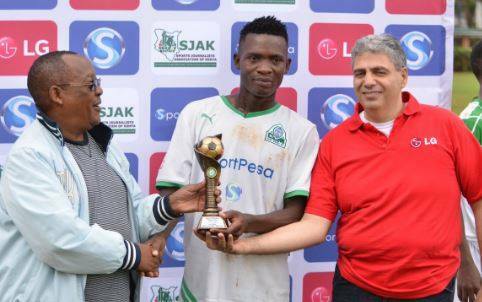 The record K’Ogalo signing thus became the first player to notch a hat-trick for the record 15-time SPL winners since LaLiga side Girona FC forward; Michael Olunga, went home with the match ball in their 4-1 demolition of Chemelil Sugar on June 27, 2015. The league leaders now have 63 points, 18 ahead of second placed Sofapaka FC and still have a game in hand over Ulinzi Stars FC as they closed in on their 16th crown. 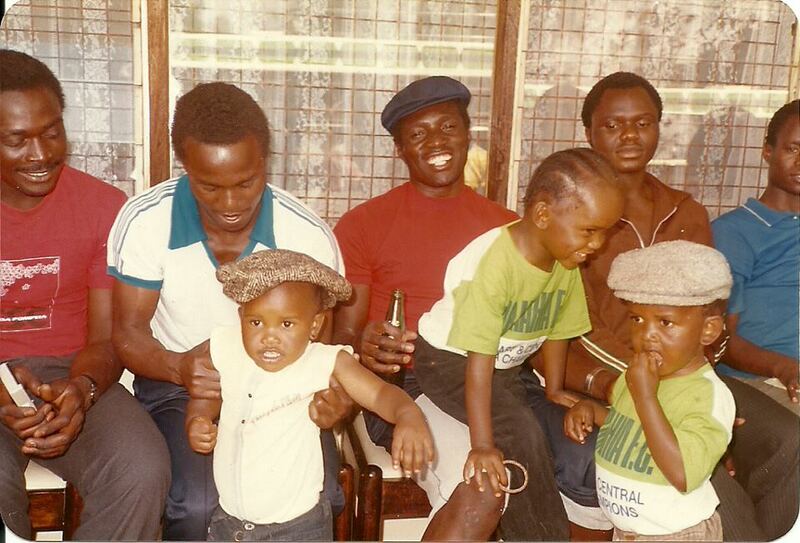 In Kisumu, both sides came into this match on the back of underwhelming results in their last outings. Gor coach, Dylan Kerr rung changes to his team, resting keeper Boniface Oluoch, the injured Karim Nizigiyimana and Jean Baptiste Mugiraneza. 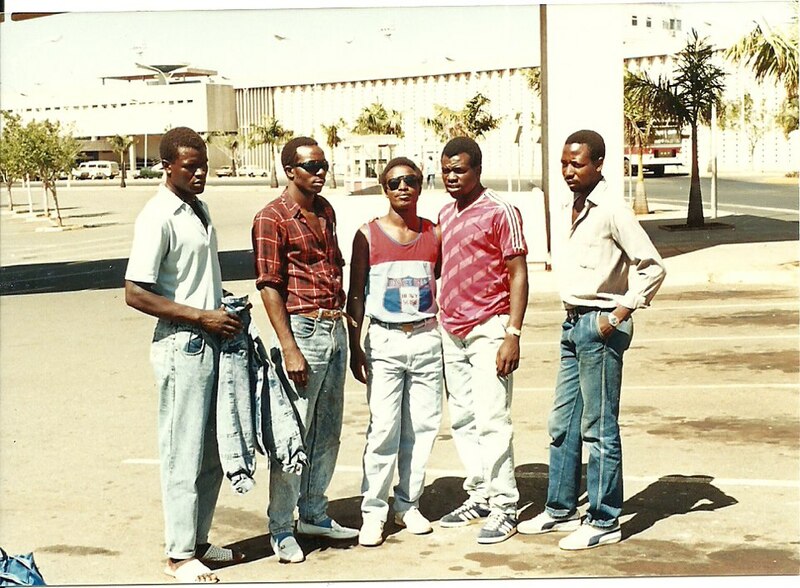 In their place came in Peter Odhiambo, Innocent Wafula and Philemon Otieno. His opposite number William Muluya, with one eye on the GOtv Shield final against Leopards on Friday, made wholesale changes. Francis Manoah, Sanneh and Wycliffe Otieno who came in as skipper took their place in the starting XI that had Geoffrey Shiveka leading the list of absentees. It did not take long before K’Ogalo proved their credentials as title holders in waiting with the trio of Kenneth Muguna, Francis Kahata and Otieno dictating the pace from the middle of the park. Tuyisenge made their early dominance count with the opener when he mopped up a well constructed move. Even before the decibel levels could go down in a city that has been rocked by the stench of death following a violent clampdown on political protests, the Rwandese forward notched his double when he gave John Oyemba, in the Sharks goal, no chance with an exquisite finish. Tuyisenge was not done yet as he claimed the match ball inside 23 minutes for his first SPL hat-trick since he joined K’Ogalo in January 2016 to leave Sharks reeling five minutes to the break and staring at a good old hiding. And it should have been four for the Rwandese seconds before the breather but on this occasion, his canon shot came off the bar with Oyemba soundly beaten. With the sizeable Green Army supporters baying for more goals, Gor picked off from where they left after they switched sides, forcing Muluya to resort to damage control in a bid to prevent the rout. Elly Asieche, Juma and midfielder Ovella Ochieng’ who rejoined the Sharks from what the club stated was an ‘exchange programme’ with Swedish top tier side, Djurgardens where Olunga made his name last season, came off the bench. Their introduction had the desired effect, stemming the one way traffic and Sharks improvement was rewarded 15 minutes from full time when they earned a spot kick after Wafula was adjudged to have handled inside the box. Juma made no mistake from 12 yards, sending Odhiambo the wrong way to pull one back and embellish the scoreline but Gor comfortably saw out the rest of the match to inch another step closer to glory.